As I mentioned in an earlier article, I momentarily lost access to my Edge Browser. One of the reasons I lean on Edge is its integration with Cortana, Microsoft’s virtual assistant. Many of us already use Cortana as the default search feature in Windows 10. In that function, it will search your computer and the web trying to give you an answer best suited for the question asked. Sadly, for individuals who don’t like Edge or Bing, it happens to be Microsoft’s only default browser and search engine when asking Cortana a question. I find it amazing how quickly we can become dependent on a feature that was only recently available for the masses. For me, it started with my smartphone– every time I needed a quick piece of information, Siri or Google came to my rescue. I only had to press a button on my phone and ask for an answer. Amazingly, it not only gave me the answer I needed, but it did it instantly. Therefore, when Microsoft introduced Cortana with the release of Windows 10, I was intrigued. I have become used to using it and with the recent crash of Edge I had experienced, it became apparent just how used to it I was. It quickly became annoying to have to type everything when I just had to ask before. Sadly, right now, saying, “Hey Cortana, give me articles about the new Avengers 4 movie”, would result in Edge opening to a blank page and just sitting there. But, as I said, this gave me an opportunity to check out other options. I had remembered reading about the ability to redirect Bing and Cortana to other browsers and this appeared to be the perfect time to give it a try. When I first read about using Cortana with other browsers the link to make that happen was a program called Chrometana. It was actually developed just days after Microsoft CEO Satya Nadella announced Cortana in 2014. That program is no longer supported by its developers but the project was taken up by someone else and then released as Chrometana Pro. There is surprisingly little information on the history of Chrometana or the Pro version. I am usually reluctant to install programs that are no longer supported but the copy I installed has a 2018© by a Marc Guiselin, so I decided to move forward. 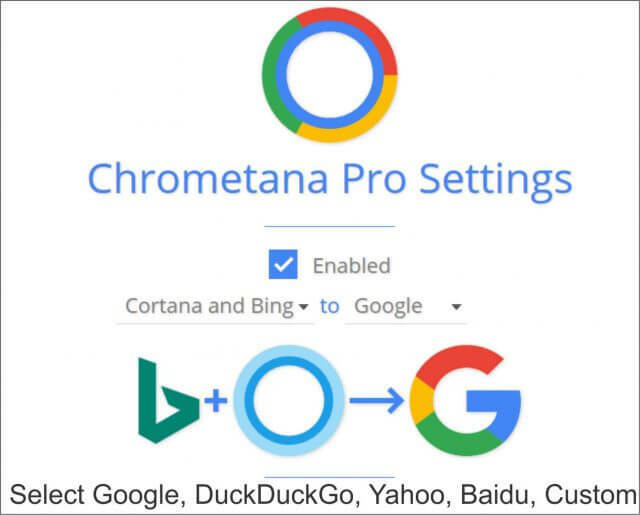 If you use your digital assistant on your smartphone but really dislike Edge or Bing, this just might be a chance to have the best of both worlds. Below is my step-by-step installation. All pretty straightforward and easy. Now when you ask Cortana a question that is web-related, it will open Chrome instead of Edge. In addition, you have the option of using other search engines by making your selection during setup. These are easily changed at any time by clicking on the Chrometana Pro Icon. After going through the process of setting up Chrometana Pro, I decided to try a small program called EdgeDeflector. This is actually a computer program and not an extension for your browser, so it does not depend on any specific browser. Once installed, just make the browser of your choice your default browser and when Cortana is asked a question, it will open that browser. I have tried this with several of my browsers and it works flawlessly each time. If you want to use Cortana and you know which browser and search engine you want to use, this is without a doubt the fastest way to do it. If you like Chrome and like to fool around with different search engines, then Chrometana Pro might be for you. I like a lot of browsers for a lot of different reasons. Having the ability to direct Cortana on which browser to use by simply declaring a new default makes it all very efficient for me. If I had to choose one, it would be EdgeDeflector because it is non-browser specific. Supposedly, you can use Chrometana with Firefox but I have not bothered to try it simply because once I tried EdgeDeflector I had found all I needed. With the soon-to-be-released version of Edge that will work with previous versions of Windows, and for those of you who dislike Edge or Bing for that matter, this is a pretty painless way to include a computer digital assistant in your favorite browser. Other browsers may be OK but Google has a much bigger range of useful ‘equipment’ that other browsers don’t have. Thanks for the comment Jonin, While I use a few different browsers I do keep finding myself using Google, there is no doubt that the search engine is the best.